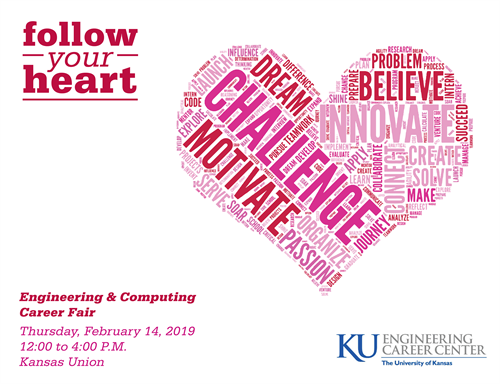 KU Engineering & Computing Spring 2019 Career Fair - Feb 14, 2019 - • The Chamber - Lawrence, Kansas. Each spring, KU's Engineering & Computing Career Fair attracts more than 100 companies looking to hire KU engineering & computing students to add to their ranks. It's the ultimate opportunity for students to connect with employers and to secure an internship or job. Recruiters connect face-to-face with more than 800 top-tier students. Many of these employers choose to hold next-day interviews here on campus and will invite students they meet at the career fair for an interview. Don't miss out on the opportunity to get connected! Registration is required. Visit www.ecc.ku.edu and click on the career fair graphic for details..